What do forests do? 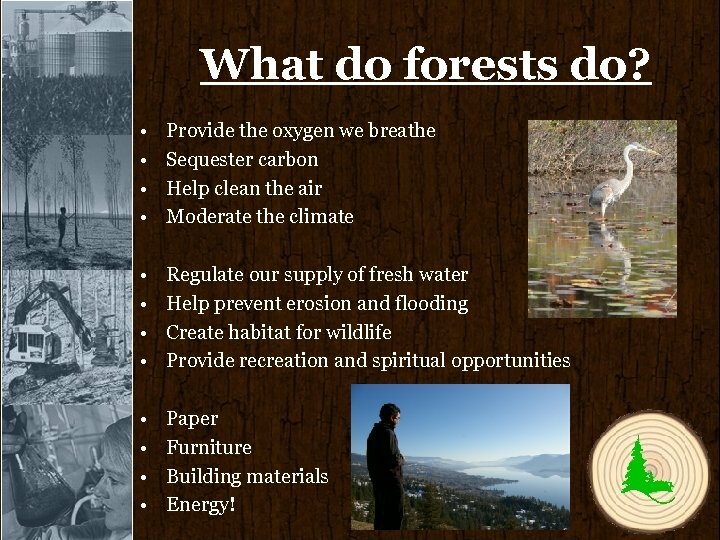 • • • • Provide the oxygen we breathe Sequester carbon Help clean the air Moderate the climate Regulate our supply of fresh water Help prevent erosion and flooding Create habitat for wildlife Provide recreation and spiritual opportunities Paper Furniture Building materials Energy! Forests and You Well-managed forests are: • A renewable resource • Critical to Canada's economic, social and cultural wellbeing • Essential to environmental sustainability! 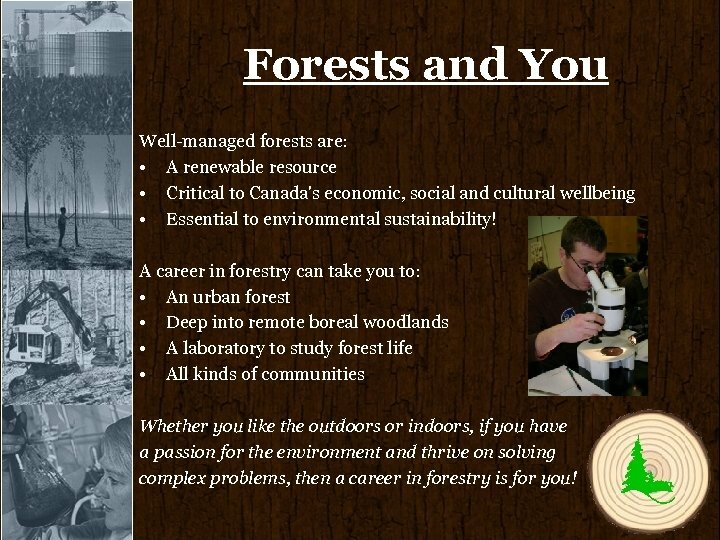 A career in forestry can take you to: • An urban forest • Deep into remote boreal woodlands • A laboratory to study forest life • All kinds of communities Whether you like the outdoors or indoors, if you have a passion for the environment and thrive on solving complex problems, then a career in forestry is for you! 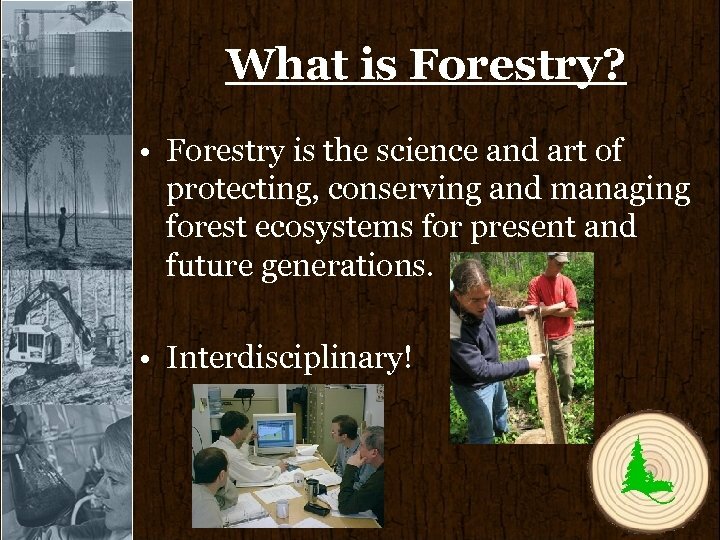 What is Forestry? • Forestry is the science and art of protecting, conserving and managing forest ecosystems for present and future generations. • Interdisciplinary! 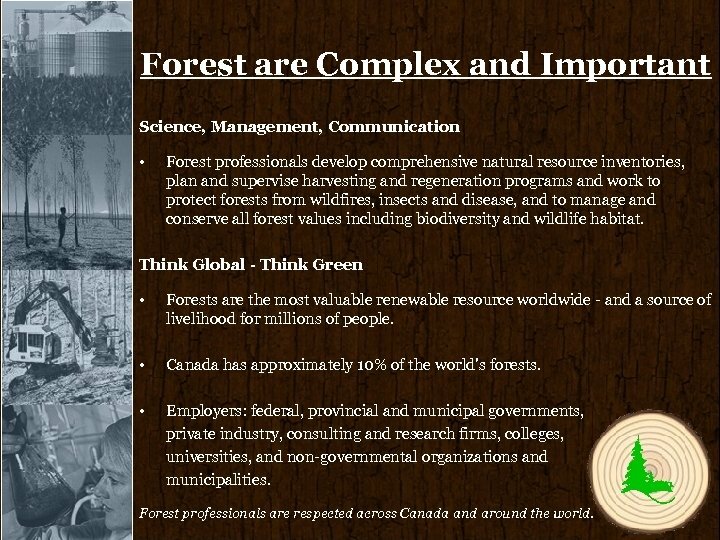 What do Forest Professionals Do? 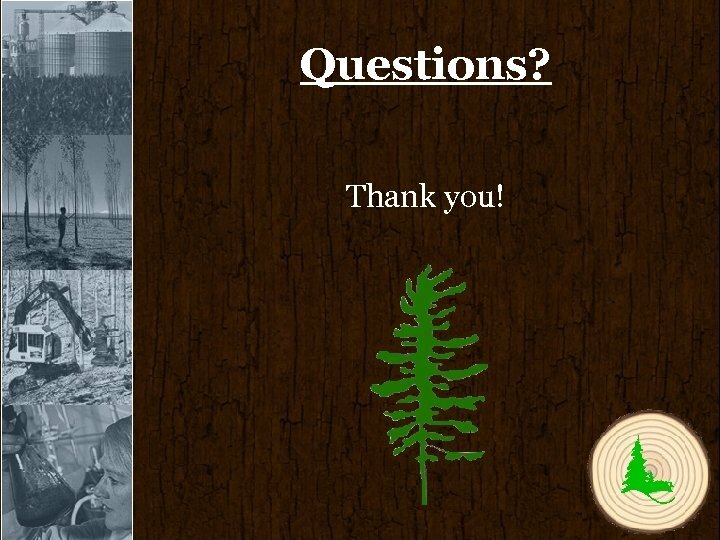 • Understand the relationships between people and forests, wildlife, ecology, fire and pest detection and control, wood science, harvest operations, forest regeneration and manufacturing processes. • Design, implement and promote management programs that have a positive impact on diverse public and private needs. • Develop an understanding of the broader economic, environmental, and social dimensions of managing renewable resources to consider all users and uses. 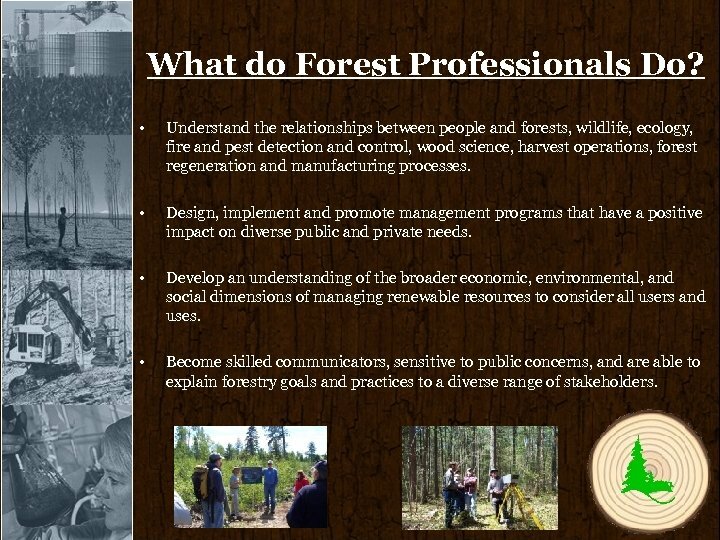 • Become skilled communicators, sensitive to public concerns, and are able to explain forestry goals and practices to a diverse range of stakeholders. Forest are Complex and Important Science, Management, Communication • Forest professionals develop comprehensive natural resource inventories, plan and supervise harvesting and regeneration programs and work to protect forests from wildfires, insects and disease, and to manage and conserve all forest values including biodiversity and wildlife habitat. Think Global - Think Green • Forests are the most valuable renewable resource worldwide - and a source of livelihood for millions of people. • Canada has approximately 10% of the world's forests. • Employers: federal, provincial and municipal governments, private industry, consulting and research firms, colleges, universities, and non-governmental organizations and municipalities. 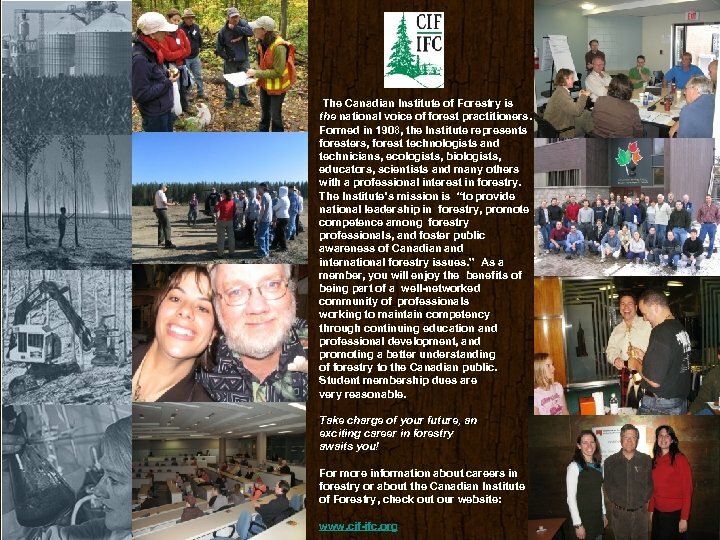 Forest professionals are respected across Canada and around the world. 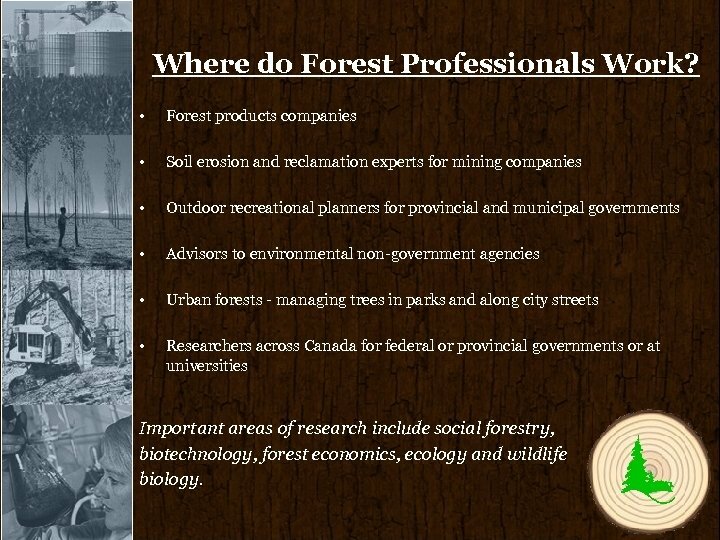 Where do Forest Professionals Work? 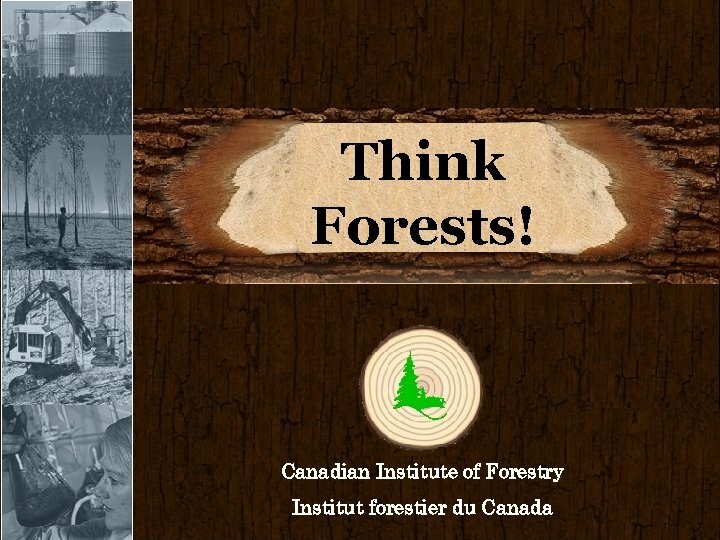 • Forest products companies • Soil erosion and reclamation experts for mining companies • Outdoor recreational planners for provincial and municipal governments • Advisors to environmental non-government agencies • Urban forests - managing trees in parks and along city streets • Researchers across Canada for federal or provincial governments or at universities Important areas of research include social forestry, biotechnology, forest economics, ecology and wildlife biology. What Does it Take? Training to become a forest professional generally requires a diploma from a technical college or a degree from a university specializing in forestry or related natural sciences. A university degree usually takes four years to complete. 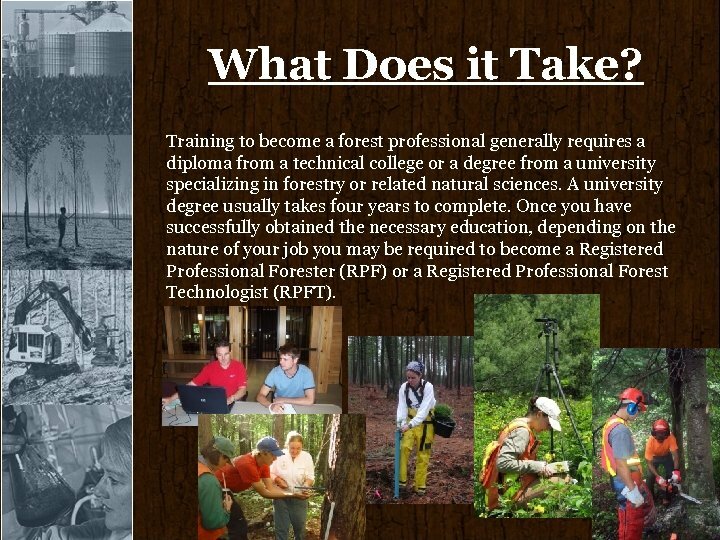 Once you have successfully obtained the necessary education, depending on the nature of your job you may be required to become a Registered Professional Forester (RPF) or a Registered Professional Forest Technologist (RPFT). What Does it Take? University Programs University-trained forest professionals often work with sophisticated computer systems, statistical programs and a variety of other scientific and quantitative methods and procedures. Therefore, a good understanding of high school science and mathematics is important. 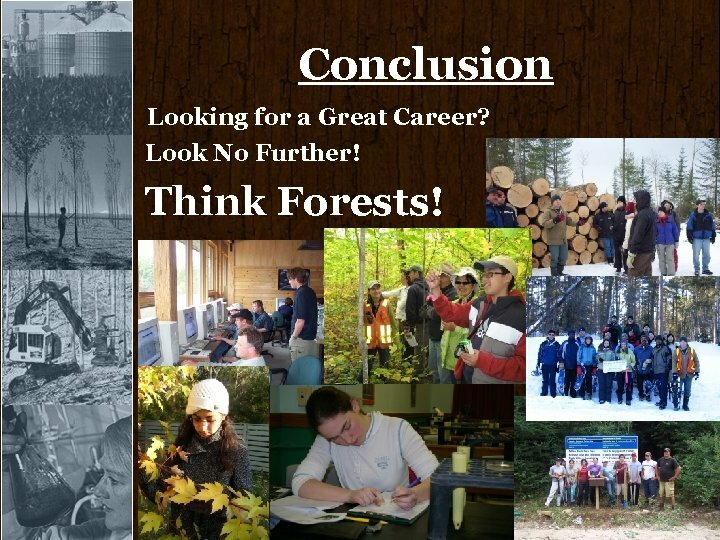 A career in forestry also requires strong oral and written communication skills and interpersonal skills. Practitioners are often involved in education, public relations, marketing and sales, and in activities such as planning, harvesting, regeneration and forest ecology. 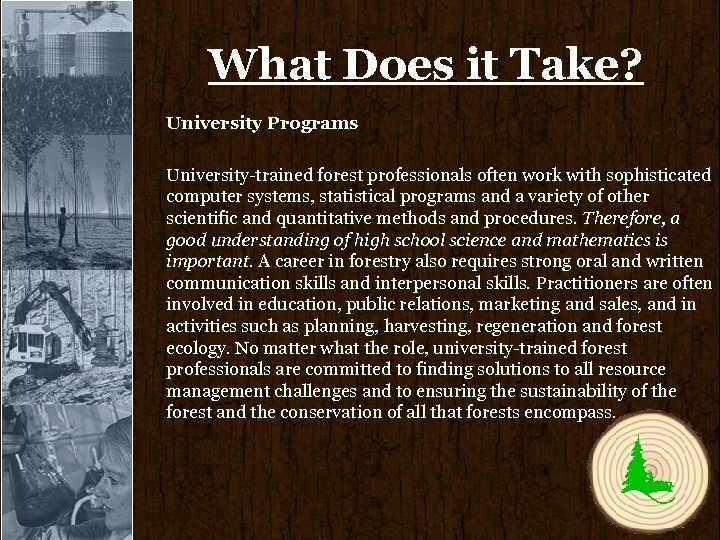 No matter what the role, university-trained forest professionals are committed to finding solutions to all resource management challenges and to ensuring the sustainability of the forest and the conservation of all that forests encompass. What Does it Take? 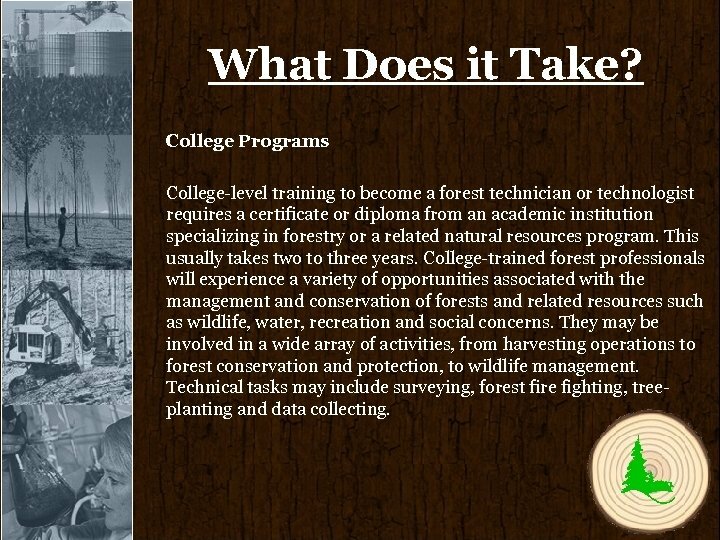 College Programs College-level training to become a forest technician or technologist requires a certificate or diploma from an academic institution specializing in forestry or a related natural resources program. This usually takes two to three years. College-trained forest professionals will experience a variety of opportunities associated with the management and conservation of forests and related resources such as wildlife, water, recreation and social concerns. They may be involved in a wide array of activities, from harvesting operations to forest conservation and protection, to wildlife management. Technical tasks may include surveying, forest fire fighting, treeplanting and data collecting. 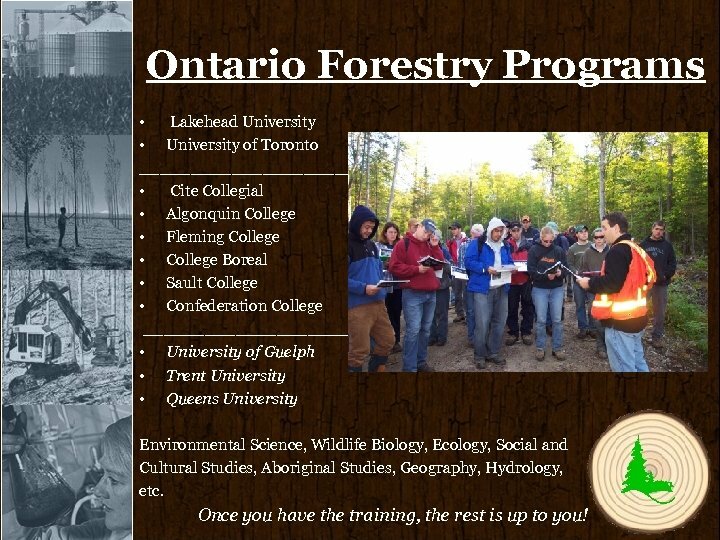 Ontario Forestry Programs • Lakehead University • University of Toronto ____________________________ • Cite Collegial • Algonquin College • Fleming College • College Boreal • Sault College • Confederation College ____________________________ • University of Guelph • Trent University • Queens University Environmental Science, Wildlife Biology, Ecology, Social and Cultural Studies, Aboriginal Studies, Geography, Hydrology, etc. Once you have the training, the rest is up to you! Conclusion Looking for a Great Career? Look No Further! Think Forests!